The staple romance simulation from Konami, first released to the PC Engine Super CD rom, then later ported to the Playstation and Saturn. The game simulates life on a high school during three years, and for each week passing, and for each free day (sundays), the player can choose what area to focus on: Math, Art, Literature, Socializing, Jogging, Resting and so on. The game is about balancing the main character's various stats; knowledge in science, culture, art, health, sociality, good looks, tenacity etc. As the game progresses, and the player's stats rise, the player will encounter various girls, depending on what stat he is currently raising. The player can date the girls he has encountered, and try to make a good impression by saying the right things on the dates (multiple choice). If one of them likes the player enough at the end of 3 school years, they will confess their love beneath the legendary tree in the school yard. Balancing the stats is not an easy feat, as the girls will expect some attention. Neglecting to date an encountered girl will cause her to "spread bad rumours" which, if left alone, will affect everyone in the game. The game contains a lot of hidden random events with quite many in-jokes. 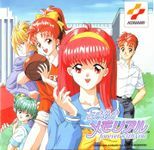 The game was such a hit, it spawned several uncountable spin-off games such as interactive fiction, drama games, puzzle games, quiz games, as well as the anticipated sequels Tokimeki Memorial 2 for the Playstation, Tokimeki Memorial 3 for the PS2 and Tokimeki Memorial 4 for the PSP.